The King’s Boat Club had a large group of pupils racing, some for the first time, at Burway Small Boats Head. 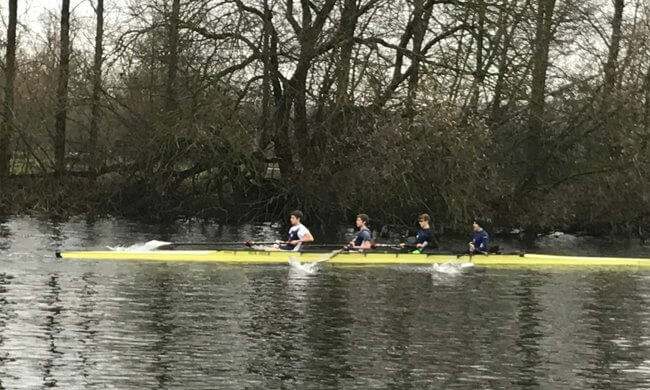 The senior boys, Tom Wingfield, Ian Wingfield, James Crawley, Alex Lapsley and Niamh Carter, made their presence felt by being the fastest junior and senior Coxed Four on the day. The Wingfields were also the fastest pair overall. A girls’ quad, Tash Southorn, Cissy Williamson and a rower from Kent College (Amelie Gerecke), raced with coach Freya George and came in as the fastest women’s quad. The J16 pair of Alex Smith and Thomas Lazarevic came 2nd but 11 seconds behind the J17 pair of Bruce Peng and Finn Mullen. The newer 6b girls, Holly Freeman, Adira Yahya, Isabella Rush, Catherine Wiseman and Carolina Padilla-Maier, raced well with Tiffany Zhang and Cissy WIlliamson joining, with both combinations within a few seconds of each other. The Remove boys had their first race but suffered a blade breakage which unfortunately slowed their progress. Fatima Mansoor and Issy Sugden raced their double, as did Tash Southorn and Amelie Gerecke who came second. King’s also boated two Shell girls’ quads and one boys’ quad, George Gibbs, Bear Cochrane, Jasper Wolff, Theo Outram and Hugo German, who won their event. A whole number of crews raced well getting invaluable time on the water. Next Saturday is the traditional Christmas Eights at the lake with the last event being the Indoor Rowing heats at Herne Bay for JKS and Shells on 12th December.